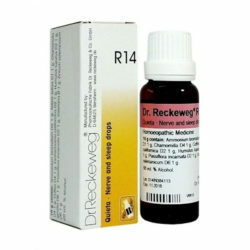 Inflammation of the kidneys, renal calculi, sharp stinging pains in the kidneys, pains in the sacral region is relieved with help of Dr. Reckeweg R18. Equisetum hiemale: Similar effects on kidneys and bladder as cantharis, through its content of silicic acid. Lessening of bladder tenesmus and bloody urine. Enuresis, bladder irritations (mainly in women), albumin and blood in urine. 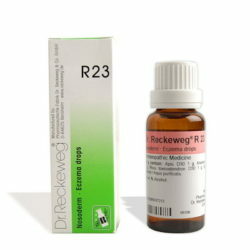 Removes uric acid (causing pain when urinating). 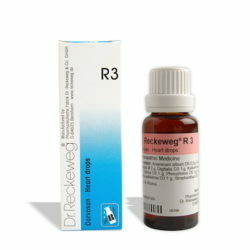 In acute cystitis and cysto-pyelitis, 10 drops of Dr. Reckeweg R18 in some water one hourly to begin with, thereafter two hourly. As soon as improvement sets in administer 10-15 drops in some water 3-4 times a day. 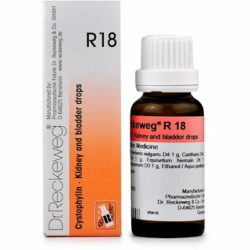 In chronic cystitis, cysto-pyelitis and bacteriuria: administer 10-15 drops in some water 2-3 times daily before meals until disappearance of symptoms. 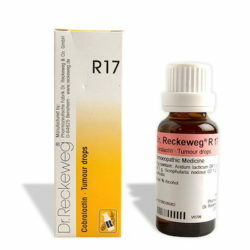 In bladder irritation: 10-15 drops of Dr. Reckeweg R18 in some water once or twice a day.